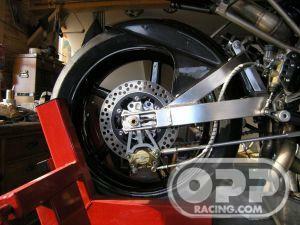 Bike was built from a donated frame, ebay engine, swing arm, ignition boxes, GSXR1000 forks & brakes...etc etc. Engine;800cc Monster, hi comp pistons, porting by Bruce Myers, light flywheel, 39mm FCRs on owner fabricated short manifolds. All extraneous tabs, brackets, and most of the rear section of frame removed. All bits that could be, were lightened or eliminated. Sharkskinz bodywork customized by owner. Paint/logo by friends. Thanks to Fat Bobs Ice Cream for use of their logo. Penske rear shock built for bike and owner/rider. GSXR forks re-sprung, but valving left untouched - they work better than OHLINS on my other Supersport! Bike is sooo light that the brakes are almost too powerful. Stock Tokico calipers and pads from GSXR. Racetech Axis rotors-iron. Brembo superbike master cylinders. All non-critical fasteners replaced with Custom aluminum - super high quality! Critical fasteners replaced with unobtanium where it was available. This project couldn't have come together without the inspiration and assistance from Eric Colbath from Clubhouse Motorsports in Moultonboro, NH. one of a kind exhaust syst. designed and fabricated by my friend Doug Cook specially for this bike/engine.